A bill of £350 million every week for EU membership. You may have seen this figure often in recent weeks. At a highly conservative estimate, it works out as a net contribution of £8.5 billion a year spent on the EU’s priorities. That’s a net contribution of £23 million every day of the year. Where is this money going? It helps the EU indoctrinate children (£500 million), subsidise three empty airports in Poland (£80 million) and transport 1000 officials from Belgium to France and back (£130 million) every year. Notoriously, the EU fails audit year after year. Now everybody in Wycombe knows that the NHS and Wycombe Hospital are our top priorities. Our NHS Trust spends a total of about £370 million every year. Accurately stated, our weekly bill from the EU is nearly as much: £367.4 million (ONS spreadsheet). The Government are protecting the NHS: we are increasing funding by £10 billion a year by 2020 with £6 billion a year delivered by the end of 2016-17. But this is not enough and the Chancellor’s recent Budget was left with a big hole. As the Bucks Free Press reported, our local hospital trust has overspent this year by about £10 million. More details, including the causes and what will be done about it are available among the Trust Board papers, specifically here. I know where to find the money. 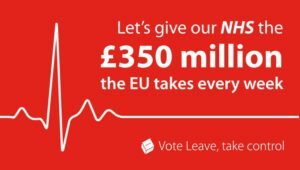 If we vote leave and take back control, just half of one day’s net EU payment will more than cover our local NHS Trust deficit. If we Vote Leave and invest more in the NHS then we could end the current health crisis, nurse the NHS back to health and improve care for patients. We should spend our money on our priorities like the NHS. You can sign up to help Vote Leave, so we can take back control, here. Meanwhile, local campaigners to remain in the EU from Wycombe Labour and Wycombe Liberal Democrats must be ready to explain to the public why they prefer handing over billions of pounds of our money to be spent on the EU’s priorities instead of spending our money on our top priority, the NHS in Wycombe.